Home » Dessert » Blondies – easy, healthy, vegan, gluten-free, and very yummy! My kids and I love the blondies from Simple Pleasures bakery which is inside a gluten-free Indian buffet restaurant that we love, Earthen Jar, here in Ann Arbor, Michigan. Out of love of their blondies, I started experimenting with making my own blondies at home. These are very easy to make, healthy, vegan, gluten-free, and delicious! And they mix up really, really quickly! They are very gooey and dough-like when they first come out of the oven. Later on in the refrigerator they firm up a bit. You can use other beans in this recipe instead of the white beans. Darker beans taste fine, but they visually look chocolatey, and if your eaters think that these look like chocolate but actually they aren’t, that sets them up to be disappointed. Chickpeas in this recipe taste a bit like hummus, and, while I love hummus, it is decidedly strange in blondies, so I don’t recommend using them here. So my suggestion is to use white beans, but it’s definitely okay to experiment. This recipe is loosely based on Flourless Chocolate Chip Chickpea Blondies with Sea Salt from Ambitious Kitchen. I’ve changed which type of beans to use, removed salt, added ground flaxseed to make the blondies more cohesive, and removed baking soda and baking powder. Whew! On another topic: If you do a web search for “Valerie’s Recipes,” Google can’t find it. I think the problem is that too many websites have similar names. 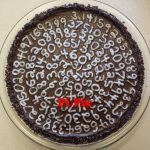 So I am thinking about renaming this blog to have a more unique name that Google might find. Maybe “The Painted Lentil” — or “The Lentil Rainbow” — or “The Rainbow Lentil”? What do you think? 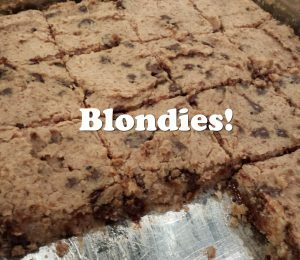 Blondies - easy, healthy, vegan, and gluten-free! Oooey gooey Blondies! Healthy, flourless, gluten-free, vegan, quick to make -- and totally delicious! Spread a few drops of oil around in an 8x8 inch pan (I like to use a silicone pastry brush for this) or spray on some gluten-free oil. In a food processor or blender, mix all ingredients except for the chocolate chips. Spread the mixture evenly in the prepared pan. Variation: Make mini-muffins by putting pieces of dough the size of ping-pong balls into an oiled mini-muffin tin, and bake for 14 minutes. Serve warm (which is super yummy, but they will fall apart) or after refrigeration (also good, and much more cohesive). Cookie Dough Dip - healthy, gluten-free, vegan, safe to eat, and awesomely yummy! 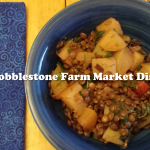 Cobblestone Farm Market Dinner - gluten-free, vegan, and makes my body oh so happy! 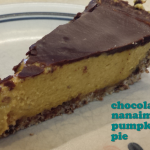 Chocolate Nanaimo Pumpkin Pie - no bake, healthy, and vegan! Chocolate Chip Cookies - no gluten, dairy, or refined sugar! The blondies look good. Wonder of boys would try it if I make them? ?